With money borrowed from his brother Clarence, an oil speculator, Henry “Hen” Berry stepped in to take over ownership of the Los Angeles Angels in 1906. Berry’s Angels won the Pacific Coast League championship in 1907 and ’08, and that success, along with his own profits in the oil business, made Berry a wealthy man in his own right. He also managed, during his tenure with the Angels, to sell a player to a big league club for the highest amount ever received by a Coast League Club to that point, when he was paid $5,000 by Charles Comiskey of the Chicago White Sox for 18-year-old Lee “Flame” Delhi in 1911; Delhi appeared in just one game for the Sox the following season and was out of organized ball well before his 25th birthday. 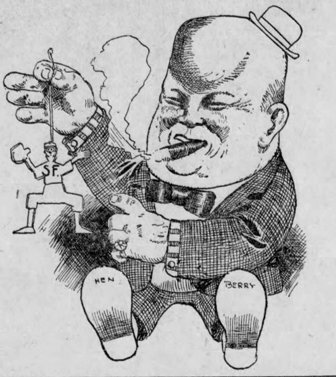 Berry was also the driving force in getting the league to finally adopt a two-umpire system in 1912. “’It is his susceptibility to the attentions of pretty hero worshippers that keep many a promising athlete from reaching the high place that otherwise would be his in the world of sport,’ asserts Berry. 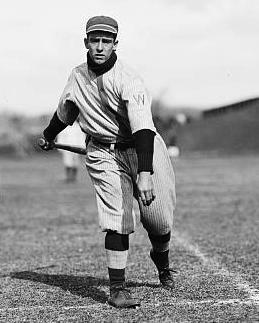 Berry’s theory had not resulted in any recent success; after his two pennants in 1907 and ’08, the Angels had experienced a drought that would continue in 1914 when his predominately married club finished second to the Portland Beavers. Berry sold the Angels after the 1914 season and moved north, purchasing the San Francisco Seals. He picked up two more championships with the Seals—it is unclear how many of the players on each pennant-winning club were married– and sold the team to group headed by former Coast League catcher Charlie Graham before the 1918 season. After leaving baseball, Berry managed the family’s oil holdings in California. On March 13, 1929 the steering broke on Berry’s car as he rounded a curve while driving near his home in Maricopa. The car plunged 100 feet into a ravine, and the former West Coast baseball magnate was dead at age 59. “Fresno will give $25,000 guarantee; guarantee 40,000 fans and sunshine for deciding game of World Series. It is doubtful Herrmann took the offer seriously, and it’s probably just as doubtful that Fisher took it seriously, but it was picked up by newspapers across the country, and Fisher enjoyed the publicity. It was a last bit of publicity before his career in organized baseball ended. Later in the month he was dismissed as manager of the Fresno Raisin Eaters, and the team was dropped from the Pacific Coast League (PCL) the following spring. Within weeks Fisher had moved on to a new project; he announced that he was in the process of forming a team to travel to Hawaii. The San Francisco Call said “It will be the first American ball team to make the trip across the Pacific in a little over nineteen years,” since Spalding’s world tour. In conjunction with Jesse Woods, a Honolulu promoter, Fisher organized a tour of the Hawaiian Islands with a team of PCL stars. Fisher chose not to get involved in the new league, but immediately went to work on an even more ambitious tour than the 1907 Honolulu trip. With the sponsorship of the Reach Sporting Goods Company, Fisher would accompany a group of stars to China, Japan and the Philippines. Early publicity promised the travelers would include Ty Cobb, Hal Chase, and Frank Chance. When the ship set sail in November of 1908 those three stars were not on board, but “several hundred fans and friends” were present when the steamer China left the port in San Francisco to see the group off. The team was substantially the same as the one that toured Hawaii the previous year—an aggregation of PCL stars and a few National and American League players– and consisted of: Jim Delahanty, George Hildebrand, Bill Burns, Pat Flaherty, Jack Bliss, Babe Danzig, Harry McArdle, Nick Williams, Joe Curtis, Heine Heitmuller, Jack Graney and Bill “Brick” Devereaux. The tour lasted more than three months, with the team barnstorming through Japan, China, the Philippines and Hawaii, playing local and US Service member teams. Though reports varied, the team played between twenty and thirty games, and lost no more than four. Fisher promised to take a team to Australia the following year. 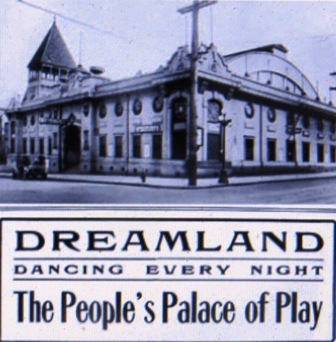 The trip never took place; instead Fisher purchased a Seattle dance hall called the Dreamland, and quickly became the target of the pious women of the city. Early in 1910 Fisher was indicted by “The King County grand jury, as a direct result of the activity of the Women’s Clubs,” for violating liquor laws, allowing “unescorted women” into his dance hall, and other assorted charges. A special prosecutor, Justice William Henry White, one of the most respected jurists in Washington State, was appointed to prosecute Fisher and other club owners targeted by the women. Herthum preached, and Fisher presented a free vaudeville show. 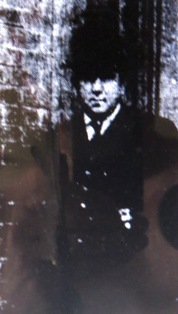 The paper said Fisher had stirred up a “protest against the effort to close the dance hall without having provided a substitute where clerks, servant girls and employees in the shops may pass an evening to their liking.” At the same time The Times noted that the prosecutor was becoming impatient with the women who brought the charges because they continually promised to provide evidence that “has not yet come to light.” The charges were quietly dismissed within weeks. Fisher left Seattle sometime in 1911 and began operating the Arcadia Dance Hall in San Francisco. Advertisement for Fisher’s Arcadia Dancing Pavilion. The following year the San Francisco Seals of the Pacific Coast League came on the market; the first name reported as a potential buyer was Mike Fisher. Fisher again got his headlines, but it was his old friend Charlie Graham who got the team. Graham, and a group of investors purchased the Seals and the former catcher was installed as manager. 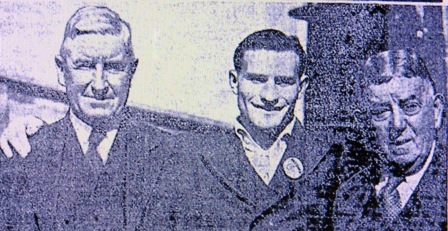 Charlie Graham, left, Mique Fisher, right, with World Middleweight Champion and actor Freddie Steele. As a result of his friendship with Graham, who recommended he get the honor, 77-year-old Fisher was selected to travel to Cooperstown to represent the PCL at baseball’s centennial celebration in 1939. The man who so loved seeing his name in the paper received headlines one more time, when he died in San Francisco on June 6, 1943. Born in New York City in 1862, Fisher’s family relocated to Sacramento, California shortly after the end of the Civil War. Fisher was a semi-pro outfielder with teams in San Francisco, Oakland and Sacramento, and in 1884-85 played for the San Francisco Haverlys in the California League. Sometime later in the decade he joined the Sacramento police force. Fisher’s only connection with baseball from 1885 until he was nearly 40-tears-old was as a fan and as a friend of a young catcher named Charlie Graham who had played at Santa Clara University and in the California League. In 1902 Detective Captain Fisher made a career change. There’s no contemporary reference to why Harris preferred Fisher to Beebe, but within a year Harris would spearhead the effort to expand the California League to the Pacific Northwest—forming the PCL, and might simply have wished to pack the league with allies for the planned expansion. The Los Angeles Angels won the first PCL championship, but it was another Los Angeles team that caused the most excitement for Fisher and Sacramento in 1903. The players were held in jail until they agreed to return to Fisher’s club, and the charges were dropped. After the 1903 season Fisher relocated the franchise to Tacoma, Washington; the move brought better geographical balance to the league, and gave the PCL a foothold in a city that had just been vacated by the rival Pacific National League. Charlie Graham remained team captain and the pitching staff was improved with the addition of Jim St. Vrain and Orval Overall. Fisher’s Tacoma Tigers took the pennant, winning both halves of the split season schedule. The 1905 Tigers started strong, winning the first half—again playing to small, indifferent crowds, then fell apart in the second half, finishing last. The Tigers were badly beaten five games to one in a postseason series by the Los Angeles Angels. In September of 1905, Fisher announced that a six-game series with the Oakland Oaks would be played in Spokane, Washington, giving rise to rumors that the team would relocate there the following season. The rumor also stirred up a conflict with the Northwestern League, who laid claim to Spokane and took their case to the National Commission. Logic did not win out. By November Fisher had negotiated a deal to move the team to Fresno, California, a town with roughly one-third the population of Spokane—the PCL made it official in January of 1906 that the Tacoma Tigers would become the Fresno Raisin Eaters. Fisher had owned a half interest in the team in Tacoma, he gave up his ownership stake in Fresno and signed a three-year contract with the club. It turned out to be another bad decision. Fisher, for the first time, managed a team without Charlie Graham by his side. The catcher started the season with the Boston Americans (his only big league season), but left the team in May to return to San Francisco a month after the 1906 earthquake—various sources attributed his departure to being homesick, wanting to be near family, or to attend to his wife who was ill; in any case he never returned east and signed with the Sacramento Cordovas in the California League in August. Fresno was a last place team from wire-to-wire, finishing with a winning percentage well below .400. 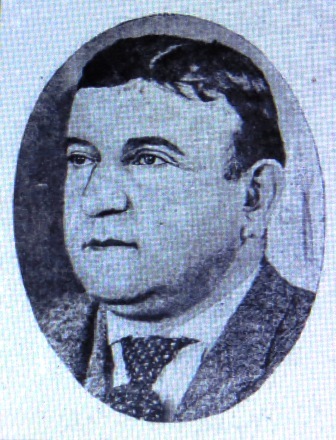 Wallace “Happy Hogan” Bray was named to succeed Fisher as manager, but Fresno was dropped from the PCL after the Seattle Siwashes withdrew from the league, in order to maintain an even number of teams. Fisher’s managerial career was over, but his baseball career was not; more on that tomorrow. 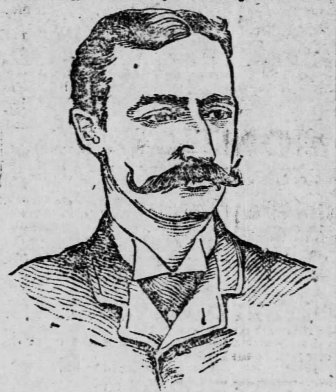 William Ingraham “W.I.” Harris was one of the most important baseball writers of the 19th Century, but like Charles Emmett Van Loan three decades later, he died young and is mostly forgotten today. “(Conrad “Dell”) Darling never was a first class catcher and never will be. (Charles “Duke”) Farrell is a strong hitter, and at times a most brilliant catcher, but he is not a steady or remarkably heady catcher. Boyle is a good one, but he isn’t in it with such good men as (William “Buck”) Ewing, (Jack) Clements, (Charlie) Bennett, (Charlie) Ganzel, (George “Doggie’) Miller, (Connie) Mack, (Michael “King”) Kelly, (John “Jocko”) Milligan, (Paul) Cook and (Cornelius “Con”) Daily. On catchers the team is all right on quantity, but short in quality. “As to pitchers, (Mark) Baldwin, in 1887 and 1889, was a star In 1888 he was not to be depended on. Baldwin doesn’t take care of himself as he should in the winter time. As a pitcher he ranks among those who may be great at any time, but who keep you guessing on the dates. 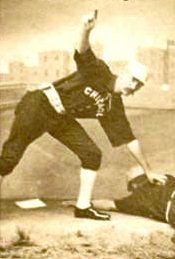 “The outside world cannot fully realize the bitter disappointment felt here over the poor showing made by Comiskey’s team during the season just closed. Surely it was strongest aggregation of players ever collected in one club, but its lack of success was mainly from two causes—lack of discipline and the miserable condition of certain members of the club. W.I. 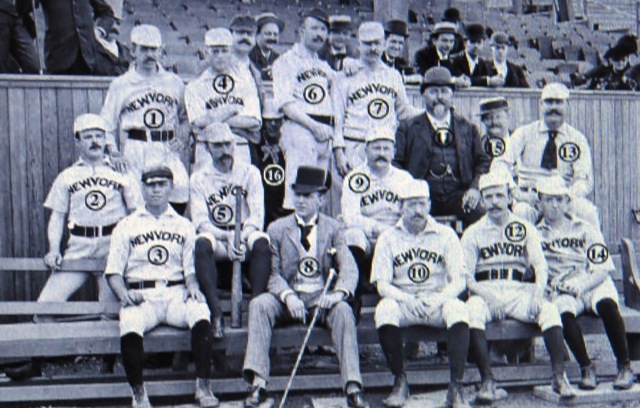 Harris (#5), as a member of the New York Reporters Baseball Club at the Polo Ground in 1889.